Is this what you want to see in Ward 4’s future? If not, is City Council listening? The above development is known as “Maranatha Gardens“, which proposes to replace single family detached homes along New Street. And local residents are not pleased that Council will likely vote tomorrow to overwhelmingly approve it. A brief moment for full disclosure…. Last year, I co-founded a community association for the neighbourhood in which I live, called the “Roseland Heights Community Organization” (RHCO); and I’m part of the current leadership team which has petitioned/canvassed that area about this project. We hit the streets hard yesterday and delivered the following information sheet to homes in and around Roseland Heights. Our primary goal was to help better inform people, and encourage more of them to get involved…. Residents’ main concerns revolve around: (1) massing (a building’s visual look and how it blends with its surroundings), and (2) scale (a building’s relationship in terms of, in particular, height and size to its surroundings). Simply put, the proposed large 6-storey apartment building is not compatible with the character of this low-density neighborhood. 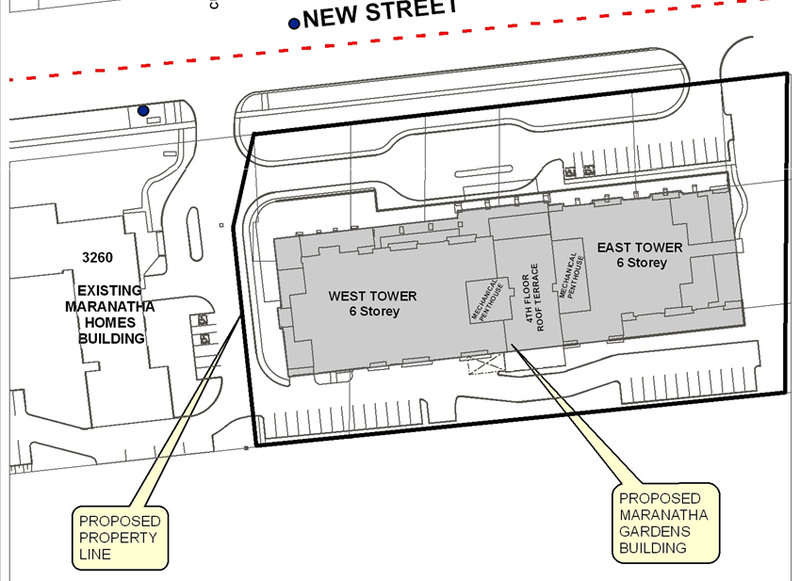 Currently, a 4-storey building is permitted – however, you won’t find anything nearby along New Street above 3-storeys. For example: “Maranatha Homes” next door is a 3-storey residence and when standing in front of it, you sense what doubling that height would really look and feel like! It’s an eye-opening exercise. The reality is that intensification forces Burlington to build up now. But exactly where, how high and in what way? There’s the rub. That friction is an escalating and daunting challenge for City staff, Council and citizens. The pressure to increase revenue from the local tax base is enormous. Some people feel City Hall is ‘selling-out’ Burlington at a tremendous long-term cost in chasing those dollars. On the other hand, City Hall is seeking to find an appropriate balance between the City’s financial needs and what its citizens want. 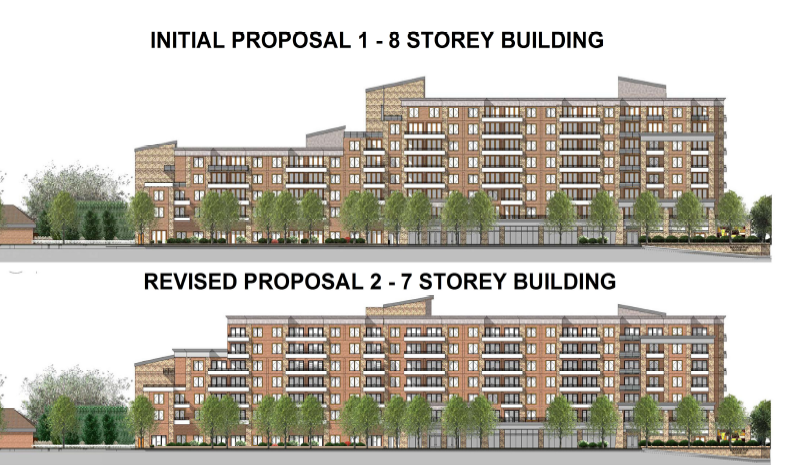 As for this development project, while most seem to accept or understand that an apartment complex will be built, the RHCO hasn’t heard from any Ward 4 residents in favour of a 6-storey building. To be clear, the developer has initially characterized “Maranatha Gardens” as an age-friendly SENIORS apartment building (that’s 55+ years of age at the Burlington Seniors Centre). It’s NOT a retirement home, long-term care facility or assisted-living. As well, based on targetted rents and the City’s own policy, it’s also NOT even about providing AFFORDABLE housing for our aging population in this case. With a 6-storey apartment building, there are also foreseeable threats to the neighbourhood, including…. 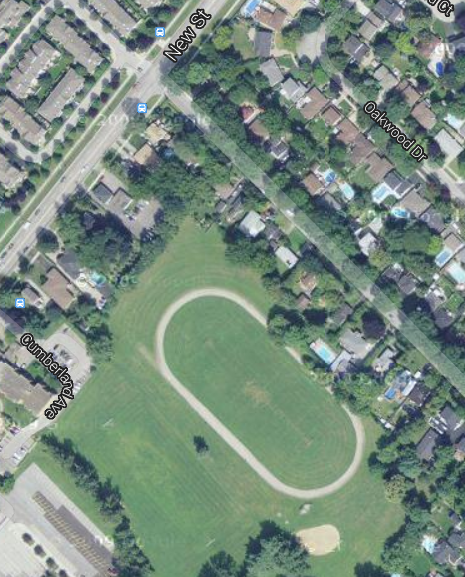 ** How will this decision impact on the final sale and utilization of lands not owned by the City at the north-east corner of the adjacent General Brock Parklands, shown below? The hard-fought battle to save that precious greenspace isn’t over. ** What about increasing traffic congestion (after all, seniors still drive cars, and so will visitors to the building)? ** Will this new development open the floodgates for similarly incompatible properties along New Street, and beyond? Having said all that, the biggest question remains. Why will our Ward 4 Councillor Jack Dennison, and nearly all of his Council colleagues, approve a 6-storey height on these lands? Sure, it can be done, but should it? Is City Hall bending to a developer’s need for 6-storeys to support its project’s economic viability (making its problem, our problem). Or, is it that residents have not been adequately informed or engaged, and they’re not communicating their issues? I believe the best answers rely on us, as active citizens, stepping forward with strong and clear voices – so Council will listen to and better represent their Ward residents specifically, and Burlington generally. It’s an election year. Please make your voice heard, and your vote count. Intensification is not about increasing the tax base or tax revenues, but about building a better city, one in which intensification in appropriate places such as main streets will enable walkable, cycle-able, and transit friendly main streets and which will enormously help preserve existing single family neighbourhoods such as Roseland Heights – leaving a better city for the next generation. I would like to hear from our elected govt. Where are they? A project of this size needs more interaction with it’s residents. Surely, they won’t rubber stamp this? Or will they? I just don’t know what the govt would or wouldn’t do anymore… The Official plan designates this land as Residential- Low Density and Residential- Medium Density.. The proposal would make this High Density. A 6 story building on the south side of New st? Completely out of character for the neighborhood.. Sought Burlington brings up images of big housing lots, tall trees and beautiful skyline… Not a view of brick and glass… Stop this building.